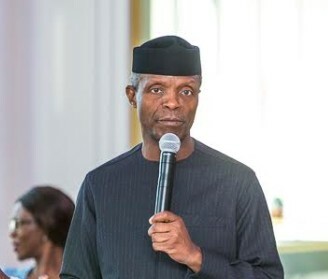 VICE President Osinbajo, is currently presiding over the Economic Management Team, EMT, meeting, specially dedicated to discuss the issue of minimum wage and how to raise the money. The meeting which is holding at the Presidential Villa, Vice President conference hall has those involved in the economy and revenue generation. Those in attendance are the ministers of Finance, Zainab Ahmed, Budget and National Planning, Udoma Udo Udoma, Industry, Trade and Investment, Okechukwu Enelamah, Labor and Employment, Chris Ngige and Minister of State for Petroleum, Ibe Kachukwu. Others are Executive Chairman, National Salaries, Incomes and Wages Commission, Richard Egbule, General Director Budget Office, Ben Akabueze, and Comptroller General (CG) of Nigeria Customs Service (NCS), Hameed Ali. Ngige, had last week told State House correspondents that he and the chairman of the negotiation committee, Ms Amma Pepple, a former Head of Service of the Federation, briefed President Muhammadu Buhari on the progress made by the committee and that the Special EMT meeting was to focus on minimum wage. Ngige had recently accused the organized labor of blackmailing the government following a two-week ultimatum given by the latter for the conclusion of the negotiation on the matter. According to him, the Labor leaders were unnecessarily blackmailing and intimidating government to pass to that minimum wage that may end up reneging on. Ngige blamed certain factors such as inability of governors to provide their figures to be debated by the committee negotiating the new minimum wage as one of the reasons for the delay, just as assured that government was still within the time frame promised to deliver on new minimum wage and was not stalling the process as alleged by labor. The organized labor had in May 2016 demanded to pay rise on the current N18,000 national minimum wage to N56, 000 and later raised to N65,500. Buhari had in November 2017 inaugurated the National Minimum Wage Committee with a mandate of arriving at a new national minimum. But the organized labor had the federal government of not being sincere in coming up with new minimum wage and warned that labor should not be pushed to the wall.